When you send an image file to someone on WhatsApp, its quality gets worse. Or say that the quality of the image falls against the original image. Many times it happens that we have to send a good quality image to someone, but the quality of the image gets spoiled after sending the image through WhatsApp. To overcome this problem, today we are going to tell you two ways that you can send images without spoiling quality on WhatsApp. Step 1. Navigate to the image manager you want to send to your smartphone’s file manager. Step 2. After this, you can convert this file from .jpg (image format) to .doc (document file format). Step 3. After converting, you can go to WhatsApp and select the contact you want to send the image to. Step 4. After this, go from the chat sender option and tap on the icon with the pin (Attach icon). Step 5. Now you navigate to your converting file and tap Send button. Ask those who have an image receipt to convert this .doc (document file format) back to .jpg (image format). By doing so, you can send images without spoiling quality on WhatsApp. The first step is a little longer process, if you do not like the first method, then you can send your image file to someone else without spoiling it in another way. Must Read: How to activate YouTube Dark Mode feature in Android or PC? Step 1. For this, first you need to download the third party app to zip the file size by visiting the Google Play Store. Step 2. After this, zip through this app for the image or image you want to send. Step 3. Now you go from the option to send the chat and tap on the icon with the pin (Attach icon). Step 4. Select the zip file and send it by tapping on the send button. Ask the file to unzip the file you have sent. After unzip, the image will be received by the user sent in its actual quality. 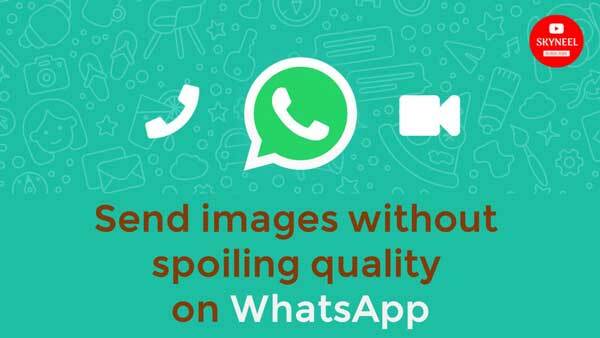 In this article we have told you about send images without spoiling quality on WhatsApp. If you liked this article then you can also like our Facebook page and subscribe to our YouTube channel too. If you have any problem related to this article, you can comment and tell us.